This time on Survivor… When Takali returns to camp, Adam asks if Taylor is up for a one-on-one conversation and he is so they go to a more private location on the beach. Adam says he did what he had to do and maybe it was a bad move, it definitely puts Taylor in a worse position and he admits it’s his fault. 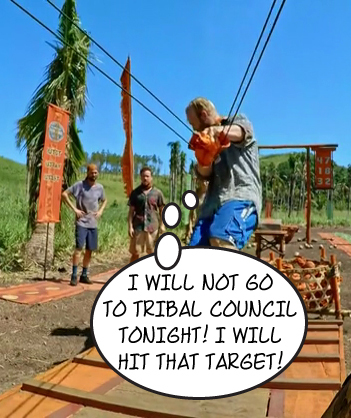 Taylor is gonna stay chill for now, but he says he will destroy Adam… The next morning, at Vanua, Dave is having breakfast with Zeke and Michelle and everything seems very pleasant, but Dave lets us know that he has his target set on Michelle. He’s afraid of Chris, though, and he thinks he has a much tighter bond with Zeke so Dave decides to show his Idol to Zeke. It’s a risky move, but sometimes you gotta take a risk. 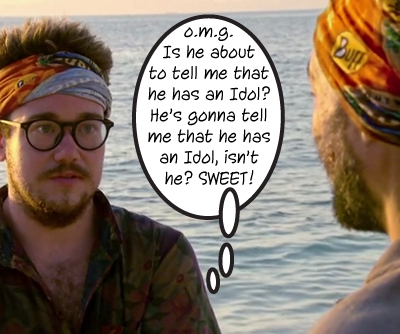 Of course, Zeke loves this new information; if he can’t have the idol, at least someone he’s aligned with has it and he understands how important a move that David just made. David is trusting Zeke with his life and Zeke says he will take care of it. Come on in, guys! It’s time for Reward! 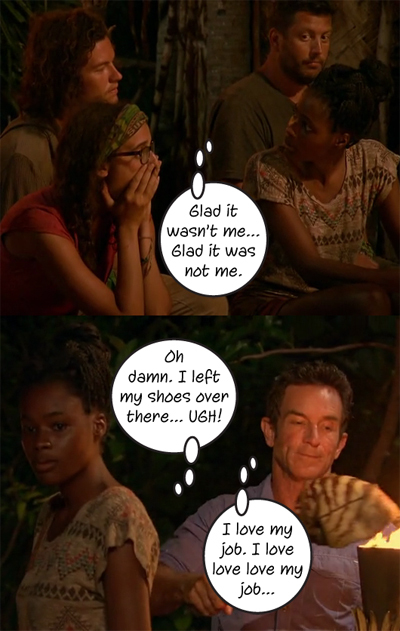 But first… Noticing the reactions to Figgy being gone, Jeff asks Michaela what she thinks especially after what she said at the last Immunity challenge. She says sometimes you say what you have to say, not what you want to say – meaning, it was time for Figgy to go so… Bye, Felicia! Taylor has no comment… So! Reward… Up for grabs? A chef will come to camp and cook all kinds of yummy food, there will be salad and CHEESECAKE for dessert. Second place finishers get some kabobs they have to cook themselves. In this challenge, each tribe must work together to unwind a bundle of three balls from a horizontal bar then shoot the balls into a basket where they will work the balls through rope tunnel. After all of their balls have been collected, the balls must be tossed up to rest on two narrow boards. First time to land all three balls win first place, blah blah blah! Survivors ready? GO! Ikabula takes an early lead; with Jay standing on the shoulders of Michaela and Will, he has better leverage to fling the bundle of balls up, over, and around. Zeke and David struggle most of the other tribes with Takali not far behind Ikabula when they begin to unbundle their balls. Vanua has made it to the ball-shooting mat before anyone has made a shot yet, so it’s still anyone’s game. Ken makes the first shot for Takali then Jess and Adam get to work pushing it through the rope to the final station, but it’s not easy, and Ken can’t shoot again until the release the ball from the rope tunnel. Chris is next to land a shot, Jay makes one soon after, but Zeke and Michelle have the first Vanua ball out of that tunnel BEFORE Jess and Adam! Chris immediately lands another successful shot, Zeke and Michelle have it out just as quickly, Chris shoots again, misses, but his next one is good and just like that BAM! Chris begins tossing balls up onto the boards and BAM! Vanua wins first reward! Ken isn’t far behind in shooting and has two balls on the boards, while Michaela desperately tries to make up time for Ikabula and she does! Ikabula wins second reward. 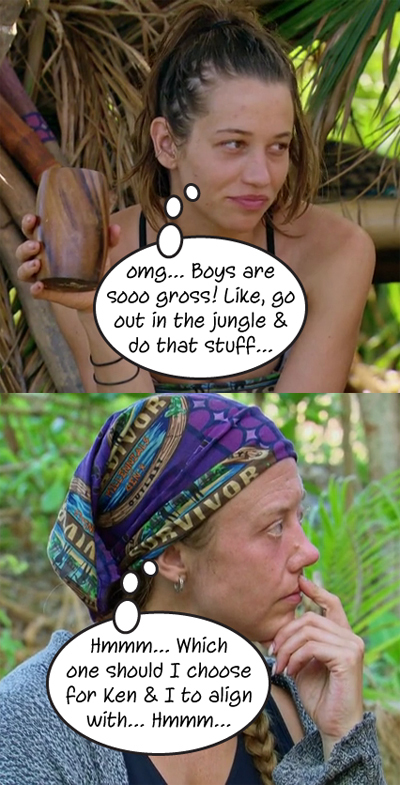 And Michaela is worried about being seen as “the one to beat” now because she is a BEAST in these challenges! Back at Vanua camp, the chef is waiting with food already on the grill and they get to eating. David says Jeff totally undersold this meal because it’s amazing, and Zeke’s inner fat kid is ready to binge on calories. While the boys shovel food into their faces, Michelle is eating, as Chris says, like a person with a fork and a knife. When the boys are finished eating, the gasses begin to be expelled from their bodies and Michelle is both annoyed and disgusted. HER mom taught her manners. lol She’s a little nervous about being with all these boys, but she’s not going to change herself. At Takali, Ken, Jess, and Taylor are talking politics, which Taylor doesn’t like to do, but he’s being honest with his answers about his own views and that of his generation as a collective. He thinks they are really going to change things and get rid of stuff that doesn’t work, like the electoral votes… Jess appreciates how honest Taylor is and decides to ask him a few questions about Adam. Taylor admits he has no loyal to Adam and come Merge time, he’ll shake on it, and he does, that he’ll never write either Jess or Ken’s name down. They appreciate it and Jess thinks that moving forward with Taylor may be better than Adam because Adam is really strategic. The next day, at Ikabula, they are all sitting around the fire and Michaela is telling a story about how she was trying to ignore a bug buzzing around her the night before. Hannah comments privately that the vibe at camp is palpable since there are four Millennials and two Gen Xers. Around the fire, Hannah begins to ask Bret, the cop, questions about his job – he lies and says he’s a funeral director, but Hannah doesn’t buy it. When Bret and Sunday leave camp to get water or something, she tells her fellow Millennials that she’s 70% sure that Bret is a cop. Jay also thinks Bret is a cop, but they all agree to play it cool around him so he reveals it on his own. Come on in, guys! It’s time for Immunity! In this challenge, tribes will toss coconuts into a big net until it’s heavy enough to raise a flag that has a set of numbers for a combination lock on it. The combination lock is attached to a key that must be used to unlock a slingshot where the tribe must knock down five targets with sandbags. So… It takes awhile, but Takali is the first to release their flag and Adam gets to work on the lock and has it done after a couple tries. Ikabula is next to drop their coconut net and Michaela retrieves their key on the first try. Vanua finally releases their flag; Michelle works on the lock and none of the other tribes have knocked down a target yet. 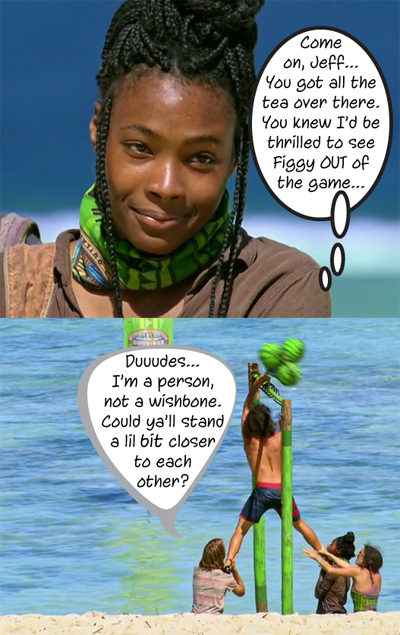 As Michelle struggles, Ken finally knocks down a Takali target, then another, and finally she gets the key out and Vanua begins using the slingshot as Ken hits another target for Takali. Aaand… Ken is on FIRE and wins Immunity for Takali! So Vanua and Ikabula are tied with two targets down, but Chris is on FIRE now and Vanua only has one target left and BAM! For the first time, Ikabula will have a date with Jeff… And Sunday says that it will only be a few minutes before they push the paranoia button back at camp. So at the Ikabula camp, Sunday lets us know that they actually sat around in silence for about half an hour because they actually all really like each other. Eventually, Sunday and Bret head out to the beach by themselves – they have to write each other’s names down, even though they promised they wouldn’t, because that’s what’s best for the one of them that stays. Elsewhere, Michaela is going over a scenario with the Millennials using shell and rocks – it doesn’t matter who they vote out because they’re final four still has two Millennials on both of the other tribes. They have the numbers no matter what when they Merge. They decide to target Bret, but they are going to split the votes in case one of them has an Idol and all vote Brett after the tie. BUT! Jay starts thinking about how smart Michaela is and how great she is at challenges, and socially back at camp, then it hits him – They should vote out Michaela tonight. Jay pulls Will into the jungle and suggests they boot Michaela from the game. Will agrees that she is VERY intelligent and reminds Jay that Michaela ALSO knows about his Idol… They know Sunday and Bret will vote for Michaela, but Jay doesn’t want to tell Hannah; she’s going to freak out either way so if they decide to make this big move, they are leaving her out of it. Jay still isn’t sure what to do, though, because the three of them are Michaela’s ONLY alliance and she will be loyal sooo… This is a tough vote for Jay, and I say it could be his million-dollar decision. Time for Tribal! 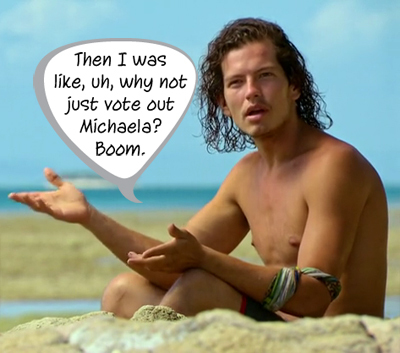 Right out of the gate, Jeff points out that the other tribes both voted out people in the majority and asks Michaela how she feels about this in regards to her tribe’s Millennial majority. She says feels good about her majority, the majorities on the other tribes are sketchy and can’t be relied upon further in the game. She thinks everyone in her tribe is very trustworthy. Jeff asks Jay how he feels about the vote outs on the other tribes and yeah, it’s just crazy. He doesn’t know what the Millennials were thinking voting out one of their own. Then Jeff asks Sunday how long they waited before scrambling and she tells him they were so bummed out that they all sat together in silence for half an hour; Michaela adds that they are a really tight group of six and if not for Jeff, they’d be tight going into the Merge. Jeff laughs – it’s always HIS fault – lol. Jeff shifts to the obvious – Bret and Sunday are the easy votes, but things could happen at this tribal just like they happened. Bret, of course, would love for this to happen – count him in! Will points out that it is dangerous to play all maverick style in voting blocks and blindsiding people; trust is important in this game and you need to latch onto it when you have it. So Michael brings up the Merge saying that they need to keep the person who they can definitely make it to the Final Five with then Jeff starts asking about what will happen to the tribe when they get back to camp. Everyone thinks the bond will be stronger. Jeff points out that there is a lot of trust on the tribe, but it’s time for someone to be blindsided. So let’s get to these votes since Jay is definitely not playing his Idol… The Votes: Bret, Bret, Michaela, Michaela, Michaela, and the reactions just keep coming folks… Before the last vote is read, Michaela looks around at the Millennials, then rests her eyes on Jay – Did you do that? She asks. He nods and says that he did. He did do that. Yup. After a great face from Bret, Hannah says she did NOT do that. After some more reaction shots, the camera is back on Jeff with the last vote revealed – Michaela has been voted out and she is NOT happy about it. Previous Article#BBOTT Teaghan (Alexs’ BF) Joins Us Live!